Shop for authentic Virginia Flags. We offer indoor and outdoor Virginia flags in durable nylon. Our outdoor flags are finished with a canvas heading, while indoor flags are finished with a lined pole hem and your choice of with or without fringe. We also offer indoor and outdoor Virginia flag sets. 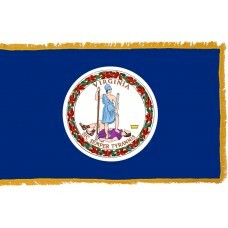 The Virginia State Flag features a dark blue field with a white circle in the center that has the Virginia state seal in it. The Virginia State seal features the Goddess Virtue in the middle who is holding a sword and a spear. Virtue has her left leg on the chest of a tyrant that she has overcome and defeated lying on the floor, who is holding a chain and a whip, and to the right of him, lays his crown. At the top of the seal, the word "Virginia" is written and at the bottom "Sic Semper Tyrannis" is written. It is thought that the Goddess Virtue represents Virginia and the tyrant represents Britain. The phrase "Sic Semper Tyrannis" is the Virginia state motto and translates as "Thus always to tyrants." The tyrants will always attempt to gain power and control, but Virginia will always defeat them, which they take great pride in and the fallen tyrant on the seal represents Virginia's victory. The seal, as a whole, represents the good over evil. 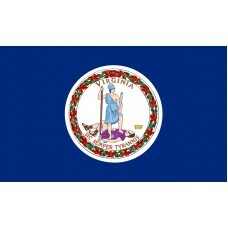 The Virginia State Flag was adopted on February 1st, 1950, but the seal was actually designed in 1776 by George Wythe. Virginia is a state that is located in the Southeastern and Mid-Atlantic region of the United States of America. It shares borders with Maryland, Washington D.C, Atlantic Ocean, North Carolina, Tennessee, Kentucky, and West Virginia. The capital city is called Richmond and the largest city is called Virginia Beach. Virginia was named after Elizabeth I (England's virgin queen). Virginia is also referred to as "Old Dominion" due to the fact that Virginia is the oldest territory of the monarchy in England. The first permanent British settlement in the United States of America was in Jamestown, which used to be the capital of Virginia. It is also referred to as "The Mother of Presidents" as 8 of the presidents of the United States of America were born here and "The Birthplace of the Nation" as the American Revolution ended in Virginia. Virginia was originally inhabited by American native tribes such as the Catawba, Powhatan, Cherokee, and Tutelo. On 13th May, 1607, the British founded the settlement of Jamestown and eventually, settlers began to arrive to Virginia and slaves were also brought in from Africa. In 1624, Virginia became a colony of Britain. Following the French and Indian war, the British began to impose taxes on the Americans, which is what instigated the Revolutionary War in 1775. During the revolutionary war, many battles occurred in Virginia, the main ones being, Battle of Great Bridge, the Siege of Petersburg, and the Battle of Yorktown (which is where the Americans defeated the British and they surrendered). As a result of their victory, Virginia officially became the 10th state of the United States of America on the 25th June, 1788.